Update: The black ZenPad 7.0 is now back IN STOCK HERE! 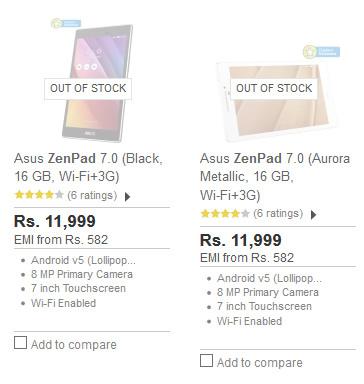 Say what you will about the ZenPad 7.0 vs. the ZenPad S 8.0, but the fact is that in about a weeks time, both colors of the ZenPad 7.0 have sold out on Flipkart. Both of these models are essentially fonepads because they have 3G phone calling ability. We are hoping to have details of upcoming ZenPad models heading into India. This “sold out” status shouldn’t be for long so please stand by for updates!